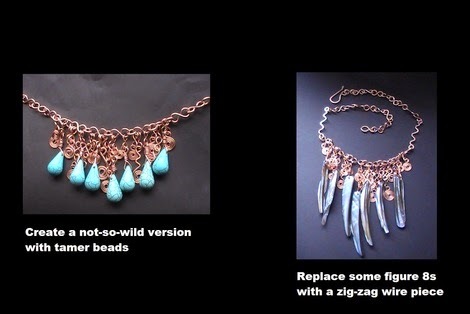 When I teach wire-work jewelry classes, I try to keep my instructions simple and easy, even for a wild and bold-lady-on-the-beach necklace like this. I admit, this piece does look a little complicated, but anyone can make it when the DIY is broken down step-by-step. It's simple. First you create the parts, then you put them together. Wordreference.com's English/Italian dictionary says frangia is Italian for fringe. It's the bold, free-form shell frangia/fringe beads that make this necklace a little wild yet perfect for summertime. When it gets a bit colder outside, the bold style will dress up even the darkest turtleneck. 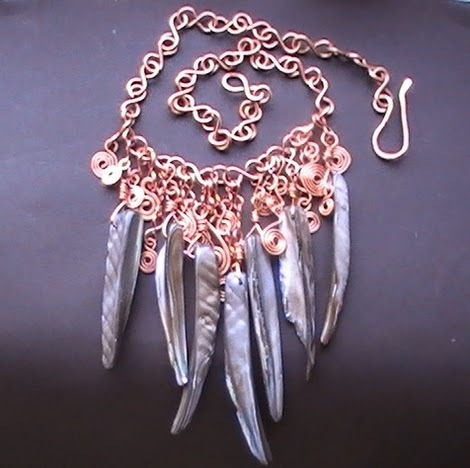 All you'll need to create one for yourself is 7 beads, jump rings and some 16 and 20 gauge wire. 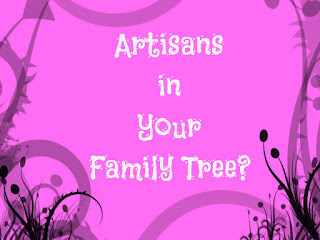 If you're into wire-working, you probably have the wire already. Depending on the price of your beads, your frangia necklace could cost $5 to $10 in materials. It will take at least an hour or two to make. Perhaps you can do a little of the work today and a little more tomorrow, or make it a tag-team craft with your teenage daughter. 16 gauge and 20 gauge wire - I used copper because it's economical for practice and makes a nice bold piece that looks good against any skin tone. You can make one with your favorite precious metal after you learn the technique. Large 16 gauge jump rings. 7 Frangia beads - I used longish bold, free-form shell frangia. If you can't find any like these, experiment with shorter frangia or any other bead with a side-drilled hole near the top. 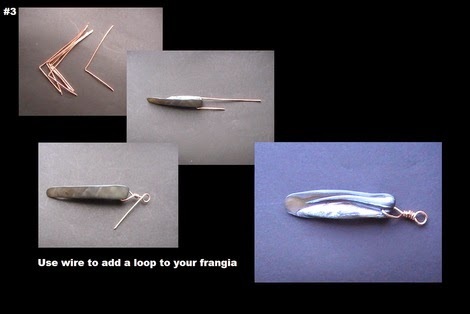 Make 44 figure 8s with 16 g wire - For instructions, see illustration #2. 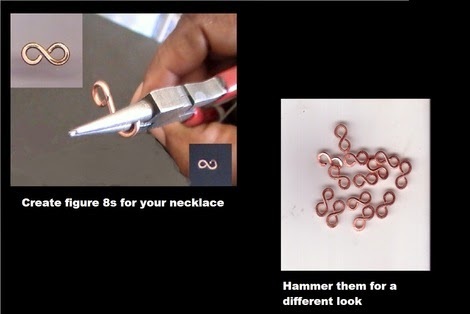 Make fewer 8s for a shorter necklace or more for a longer necklace. Buy or make 5 large 16 g jump rings. Use figure 8s if you prefer. Cut 6 pieces of 20 gauge wire 3 inches long. Form an angle on the other side, as close as you can to the bead. Wrap the short end of wire around the top of the bead, leave a triangle-shaped area of space for the bead to dangle. Make a loop and wrap the remaining wire around beneath the loop. Add a figure 8 to each bead loop. Make swirls to add details to your necklace - See illustration below. Use 16 and 20 gauge wire for variety. Make as many swirls as you desire. 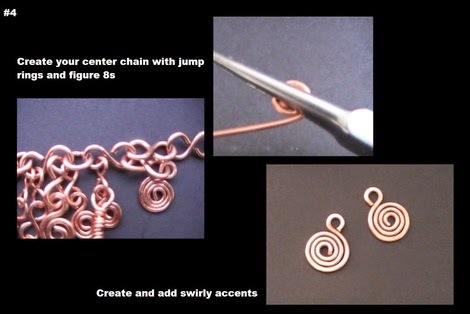 You'll also need some small 20 gauge wire figure 8s to dangle each swirl from your necklace. You will begin by creating a chain with figure 8s. First create the center section of your necklace, then add beads and trim. Use 6 figure 8s and 5 jump rings (Use figure 8s instead of jump rings if you prefer). Begin with a figure 8, add a jump ring, then another figure 8...etc. Tip: When you connect figure 8s together, open the loops outward--like a door--so you won't ruin the curved shapes you worked so hard to make. Close them the opposite way. Lay your center section out flat, then add your wired frangia beads. Space them evenly along the section and make certain they're hanging the same way. Add 20 g and 16 g swirl details. The more you add, the fuller your necklace will look. Connect 17 figure 8s together, then add them to one side of your center piece. The last one will be the "eye" for your hook. Add 16 figure 8s to the other side. Add a shepherd's hook clasp at the end. 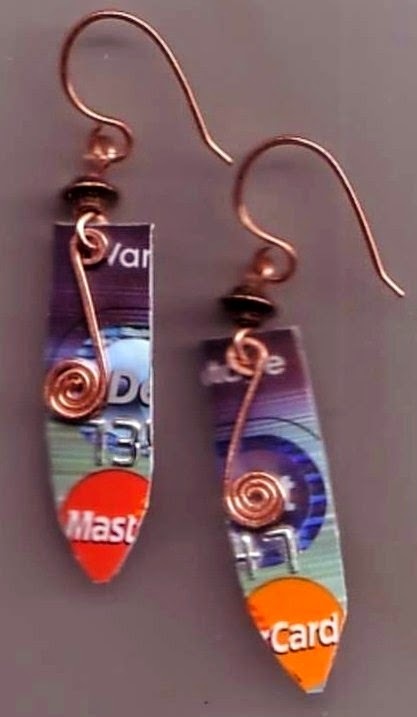 See "3 Simple Jewelry Making Secrets..." for instructions. Try it on. You'll look great. Try this necklace with any side-drilled bead. Check your favorite bead store for other styles of longish beads with side-drilled holes. They don't have to be as wild and dangly as these shell frangia. The beads you use can be smooth, long, short straight or whatever you choose.